SPECIAL; FEBRUARY 2019 JUST CAME AVAILABLE. If you are looking to get away for the Winter look no further. We just had a medical cancellation for Feb 2019 and will discount it for you. 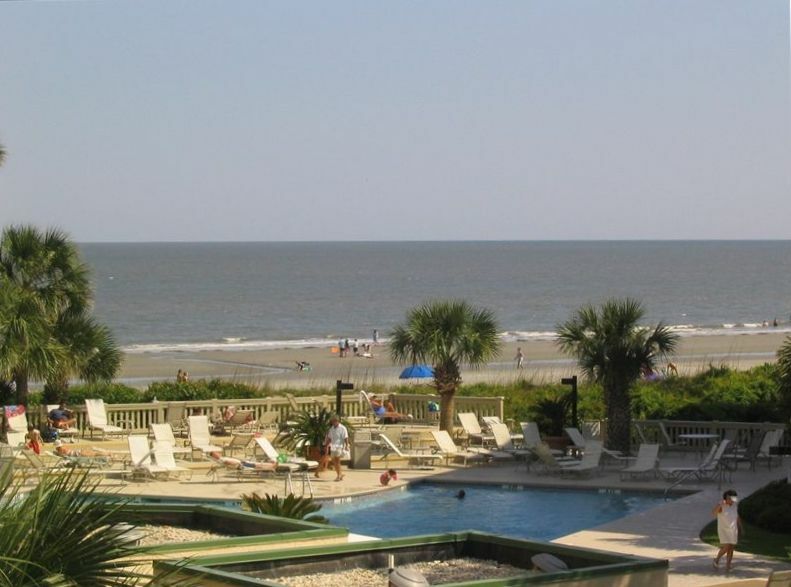 The Villamare Oceanfront complex is located between the Hilton and Marriott Hotels on one of the finest beaches on Hilton Head. The complex has beautiful grounds, barbecue area, an oceanfront pool and hot tub. There is also a brand new indoor pool, sauna, and expanded exercise activity room. Our unit, 1203 Villamare, has two bedrooms and two full baths and offers superb direct ocean views. The living area has comfortable seating, including a queen sleeper, and looks directly out to the ocean with direct access to a balcony with table and chairs. Additionally, we have just added a 42” Visio LCD TV. Just behind the living room is the dining area with table and seating for six. There is also breakfast counter with two stools. Behind that is the full kitchen and laundry area. The kitchen which has been recently remodeled, is well equipped with appliances, dinnerware, cookware and utensils. The refrigerator is new as of Dec. 2014. The laundry area has a small stacked washer and dryer. The master bedroom has a king bed and private bath with large soaking tub. The guest bedroom has two double beds and private bath. Both bedrooms have TVs and balcony access. UNIT: Phone, Air Conditioning, 3 cable TVs , DVD, Microwave, Dishwasher, Toaster Oven, Iron and Ironing Board, Washer and Dryer, King and Double Beds, Queen Sleeper, Linens, Full Kitchen, Cookware and Utensils. Free High Speed Internet. COMPLEX: Indoor and Outdoor Pools, Small Gym, Indoor and Outdoor Hot Tubs, Sauna, Charcoal Barbecue, Lounge Chairs, Covered Parking, Elevators and Gated 24 hour Security. THE HARDEST THING IS DECIDING WHAT TO DO NEXT! There are canoe and bike rentals, tennis, golf, fine dining and night clubs all within walking distance. Paved pathways make jogging or biking more enjoyable as well as safe. Boat and wave runner rentals are available at many locations on the Island. Wildlife refuges, dolphin cruises, horseback riding and fishing along with countless shops, factory outlets and restaurants are also available. For Your Comfort This is a No Smoking/No Pet Unit. Bathroom Towels provided. You will need to bring beach towels. Indoor pool and small fitness area. For guests only.